A UK diplomat who exposed a series of immigration scams is being recalled to London amid a probe into "serious anomalies" in visa applications. The Foreign Office said James Cameron, the British consul in Romania, has been withdrawn from Bucharest while an investigation is carried out. 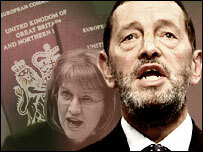 He exposed immigration system abuses which led to immigration minister Beverley Hughes' resignation in April. But Mr Cameron has reportedly accused the government of "dirty tricks". The diplomat's revelations - which included the issuing of a visa to a one-legged Romanian roof tiler - were jumped on by the UK media, sparking widespread outrage three months ago. A Foreign Office spokeswoman said: "I can confirm James Cameron, a diplomatic service officer in Bucharest doing visa and consular work, has now been withdrawn. "Information has come to light that points to serious anomalies in the handling of visa applications in Bucharest and he has been asked to return to London while an investigation into these anomalies is conducted." However, Mr Cameron, 54, has told friends he believes he is the victim of a "political prosecution" designed to punish him for providing "ammunition" to the Tories to attack the government, The Sunday Times reports. Mr Cameron fears he will be sacked when he appears before a disciplinary hearing in London on Monday, according to the newspaper. He was originally suspended in March after he had e-mailed shadow home secretary David Davis, voicing his concerns over the fast-tracking of visa applications from Romania and Bulgaria without adequate checks. He claimed the Home Office was turning a blind eye to fraudulent visa applications. Ms Hughes originally denied she had known of officials' concerns over visa applications, but was forced to quit after it emerged she had previously been alerted by another minister. David Davis said this weekend: "Had it not been for James Cameron's brave actions, much of the failures, misdemeanours and deceit would not have been exposed." "He was asked to return to London while the investigation continues"